"I design inside/out," says AD100 architect and designer Peter Marino. This holistic approach has become a hallmark of Marino's work on projects from private residences to luxury retail flagships. It is perhaps nowhere more on display, though, than at The Getty,the luxury condominium building Marino has designed along New York's High Line. Following completion of the structure, Marino looked to the inside, lending his discerning eye to the finishes, fixtures, and floor plans of the building's five units (four full-floor residences and one triplex penthouse). And, finally, he outfitted it, appointing a model unit in the building to his own exacting standards. Of course, it wouldn't be a Marino project without art—and here, the architect has ensured his building is always full of good art: Lehmann Maupin bought the gallery space on the first two floors and the Tom Hill Art Foundation will occupy the third and fourth. 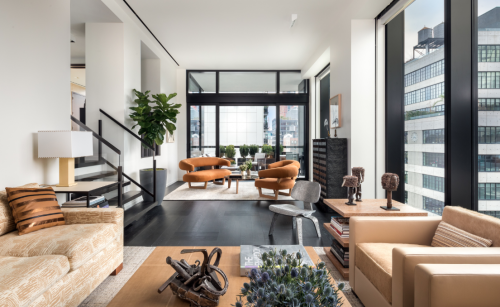 "Chelsea is known as the premier art gallery neighborhood in New York, and with The Getty it makes complete sense that art is integrated into every aspect of the building, in terms of apartment living," Marino explains. Unsurprisingly, art leaks into the model unit, too: Lehmann Maupin has placed a selection of work within the space, where they interact with the interiors in trademark Marino fashion. Marino's eye for art has informed other aspects of the interior design, too: Each unit in the building is unique in layout and color palette, with some 30 stone varieties used throughout. Bathrooms swathed in variegated marble add a depth of texture, and unusual wood grains add a natural warmth. "The purchaser is drawn into the creative process by being able to select a one-of-a-kind residence," explains the architect. "The buyer becomes the curator." And, Marino hopes, these buyers will be more literal curators, too; he's made it easy enough for them with the likes of reinforced art walls and gallery-approved lighting tracks. "The very real value of what I bring to architecture is my fine-art background and my interest in fine arts, my involvement with artists, and the way my career was launched with artists," Marino explains. "For the apartments, you have double-height ceilings, an abundance of natural light, and designated art walls that are reinforced to support hanging and installation." Of course, with floor-to-ceiling windows onto Manhattan (the building's façade is more than 40 percent glass), there's another kind of unofficial artwork at play, too: the views. "Residents have an immediate connection to the adjacent High Line Park and, from the upper floors, Hudson River views," says Marino. "Both directions—views out and views from the High Line—were considered," he explains. "The Getty, with is sculptural façade, is on one of the last corner parcels in Chelsea, and at night when illuminated, it becomes a lantern for the elevated High Line and former railroad bed just beyond." A work of art in itself.